It seems inconceivable that a man who led Motherwell to both major national finals last season could be under pressure from a section of his own fans, writes Craig Goldthorp. But that is the case with manager Stephen Robinson just now, as criticism of the Steelmen’s style of play gathers momentum on social media. ‘Depressing’, ‘dreadful to watch’ and ‘rotten’ were three descriptions suitable for publication in a family paper which described ’Well’s latest display against newly promoted Livingston. 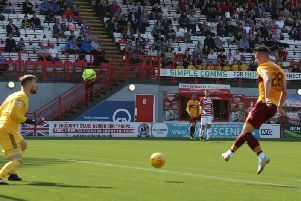 Saturday’s game – in which Motherwell battled to a 1-1 draw despite having Carl McHugh sent off – was a poor spectacle which offered scant optimism for the future for the claret and amber faithful. The atmosphere provided by the home crowd was virtually nil – even the Well Bois were silent – and it was a game short on chances or slick passing moves. But I think supporters who have a dig about ’Well’s up and at ’em, direct, long ball game are – to some degree at least – being hypocritical. The fact of the matter is that if Motherwell were winning matches and in the Scottish Premiership’s top six, these same fans likely wouldn’t care if it was achieved pumping long balls for the entire 90 minutes. They weren’t moaning last season when the robust, direct game plan favoured by Robinson garnered places in those two cup finals and a comfortable gap from the relegation area. But – as printed in this newspaper last week – the overall standard of the league has improved immeasurably this season and you don’t need to be Einstein to work out that Motherwell have at best stood still. The sale of centre back Cedric Kipre to Wigan Athletic has weakened a backline which has also been blighted by injuries to Charles Dunne and Peter Hartley. So there has been much chopping and changing at the back, with basic errors contributing to the loss of several goals so far this season. Further up the pitch, the continued loss through injury of ’Well’s greatest attacking threat from midfield – Craig Tanner – is a major negative. One win in eight league games so far this season indicates that the blend in midfield isn’t quite right, with left winger Elliott Frear great on his day but not producing it on a regular basis. Gael Bigirimana made a great start to the season but was dropped for Saturday’s match after an unimpressive display at Kilmarnock the previous week. Up front, scorer Ryan Bowman has only just come back from injury but his partnership with Curtis Main definitely offers a bit of hope. Danny Johnson and Conor Sammon are waiting in the wings to bring additional firepower. Despite confidence being low and 10th placed Motherwell sitting just two points above bottom club Dundee, I still think the Steelmen have enough about them to climb the table when everybody is fit and available. Being realistic, I think a second consecutive seventh-placed finish is the best we can hope for, as Celtic, Rangers, Hearts, Hibs, Aberdeen and Kilmarnock will surely make up the top six. But in Livingston, St Johnstone, Hamilton, St Mirren and Dundee, there are at least four teams ’Well can realistically expect to finish above. And if they do that, the moans about the style of play will surely dissipate.